At the conclusion of Peter Parker Spider-Man #75, the Green Goblin appeared to have fallen to his demise after being hit a by a bag of his own pumpkin bombs. But if Osborn could survive impalement from his glider, than pumpkin bombs were most likely not going to be able to exterminate him either. In fact, we know from the epilogue of that story that Norman emerged from the rubble and vowed his revenge upon Spider-Man. During the Revelations story arc, Norman attacked Peter directly forcing a Spider-Man/Green Goblin confrontation. 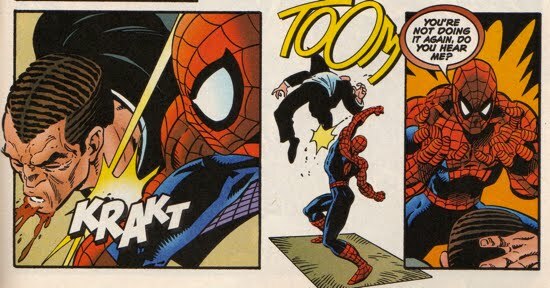 However, his next attack on Peter was intended to be much more subtle, pressuring Spider-Man into becoming the aggressor. Norman Osborn returns to the Spiderverse in Spectacular Spider-Man #248 and his passive-aggressive attempts to ruin Peter's life lead Peter to eventually give up his Spider-Man persona. 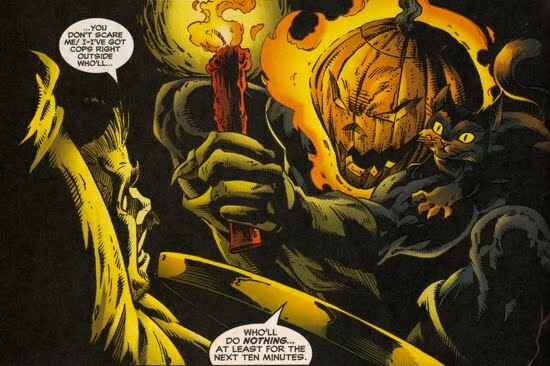 As Osborn prepares to emerge from the shadows once again, he sends Jack O'Lantern after J. Jonah Jameson with the intent of extorting the publisher. 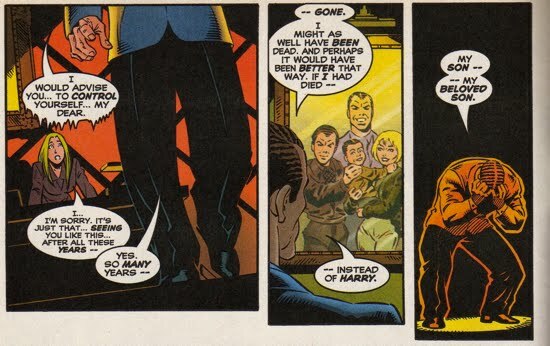 In Spectacular Spider-Man #248, Jack O'Lantern (a tandem of Maguire Beck and Daniel Berkhart) coerces Jameson into signing over half of the Daily Bugle to Osborn in exchange for the safety of his family. Jameson regretfully complies to this blackmail. In Spectacular Spider-Man #249, Osborn visits his newly acquired news center and finds Betty Brant working at her desk. Betty immediately panics, knowing Osborn's past, and phones the police. 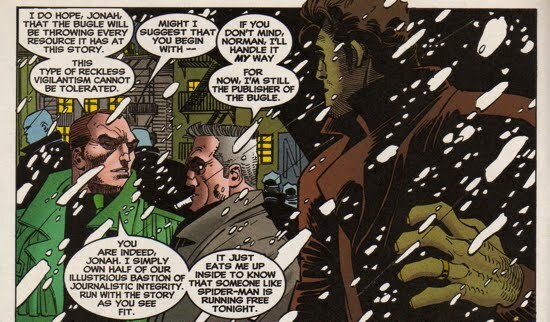 When Jameson and the police arrive, Jonah tells Brant that Norman has every right to be there because Norman now owns half of the Daily Bugle. Norman continued to haunt the people close to Peter in Spectacular Spider-Man #250, beginning with his wife Mary Jane. At the start of story, MJ awakes from a dream in which the Green Goblin is waiting outside her bedroom window (or perhaps that was not a dream...). Clearly she senses the return of the original Green Goblin. Soon after, Norman pays a visit to the office of his daughter-in-law, Liz Allan Osborn. Liz, who now runs the family business of Osborn Industries, is not happy to see her father-in-law as she screams at him, "Why don't men like you ever stay dead?!" The purpose of Norman's visit was simply to remind Liz that Normie is an Osborn and that either "[he'll] have him...or no one will!" Two weeks later, Norman holds a formal banquet announcing his return on a public stage in front of the news media. At the banquet reporters question Norman in regards to why he faked his death and he responds that he had enemies that were after him and his family. He felt his safest plan was to allow his enemies to believe that he was dead, so he faked his death and lived secretly in Europe. 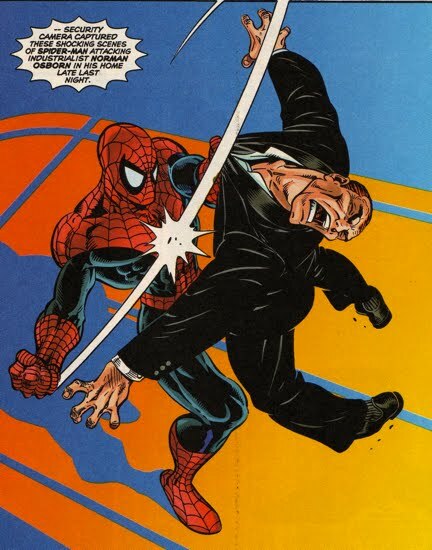 Osborn then identifies Spider-Man as one of those enemies and states that one of the main reasons for his return is to restore his family name. 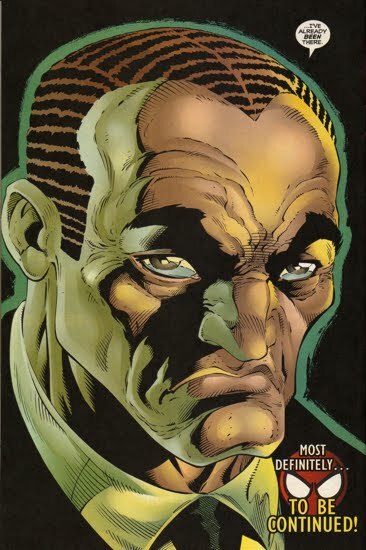 A name that was soiled by Ben Urich's book which concluded that Norman Osborn was the original Green Goblin. Norman goes on to discuss his plans to resurrect his son Harry's philanthropic Osborn Foundation as a means of doing "good works" and "helping people in need." 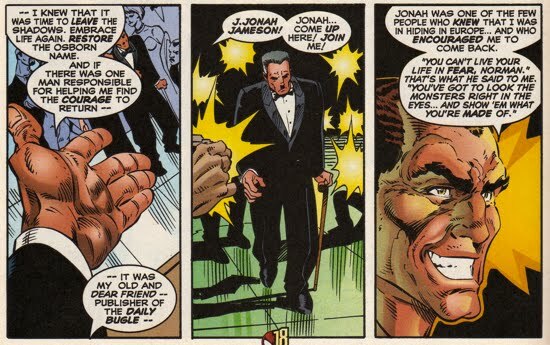 He then brings a reluctant J. Jonah Jameson to the stage, claiming Jameson was one of the few people who knew he was in Europe, and announces that the two have already donated $5 million to charity. Norman also states that Jameson encouraged Norman to return from hiding in Europe. Jonah's son, John Jameson, knows that something is awry between his father and Osborn but Jonah does not concede the truth to his son. Osborn continues to work the crowd by greeting Peter Parker as Harry's best friend and reminiscing over old times. Peter is completely aware that Norman is needling him in front of the crowd. Interestingly, Norman does go on record stating that Harry did become the Green Goblin for a brief period of time, but vehemently denies any personal involvement with the matter. Soon after, Norman takes his grandson in his arms to sit side by side with him at dinner, reminding the party-goers how important children are to the future. When Peter Parker returns home after the festivities, he finds his house ransacked and a Goblin toy holding a sign that says, "Gotcha!" amid the mess. 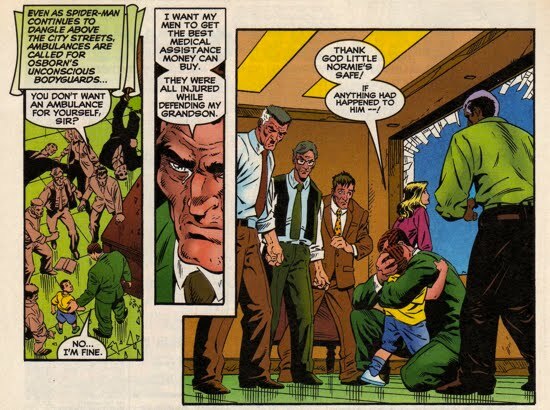 Peter immediately confronts Osborn at his executive office and pummels him mercilessly. Unfortunately for Peter, Norman has caught this abuse on tape, which fuels Osborn's claims that he is the victim of Spider-Man's abuse. It does not take long for these Osborn Tapes to go public and create massive anti-Spider-Man hysteria throughout New York. In Spectacular Spider-Man #251, the Daily Bugle than places a $1 million bounty for Spider-Man's capture. Norman is featured on the news stating that he fears for his life and the life of his Grandson, Norman Osborn II (aka Normie Osborn). This charade causes a rift between Joe Robertson and Jameson, and the editor in chief, who doesn't trust Osborn at all and can't understand why Jameson kowtows to him. With the public completely unaware of his true intentions, Norman meets with former friend/confidant from his exile in Europe, Dr. Jonas Meuller. Dr. Meuller, aka Dr. Angst, is a research scientist who specializes in the "nature of human suffering" and his work has made him an outcast from the scientific community. Osborn, who respects Meuller's work, informs the scientist that he would like to fund some of his research. In Spectacular Spider-Man #253, Meuller heads to Ravencroft Institute to visit one of his patients. His patient, later revealed to be named Sir, is instructed by Mueller that they are going to "finish what they had began [some time ago]". In Amazing Spider-Man #422, Alison Mongrain, while aboard a yacht on the Aegean Sea, tries to contact Osborn regarding payments to her Swiss bank account. It seems as though Norman has not been coming through on his part of a deal that they have, but there is a direct implication that Norman has hired her to do something. After she makes the phone call, Alison is shown with a rattle and talking to someone (or something) whom she refers to as 'Precious'. However, the mystery doesn't last long because in Amazing Spider-Man #426 it is revealed that this 'Precious' is her pet cat, and not baby May. Its highly unlikely that Norman hired her to watch this cat, and it's even more strange that the cat seems to like to play with a rattle and sleep in a baby's crib. An odd scene for an odd character. The ever increasing bounty on Spider-Man's head causes every vigilante in town to try and lay claim to the wall crawler's capture. One pair, Absorbing Man and Titania, decide they want to cash in as well, the only trouble is, they are already wanted fugitives. In Amazing Spider-Man #429, the two create new identities, Thunder Girl and Lightning Bolt, inspired, ironically, by the newly formed team of villains-turned-heroes called the Thunderbolts. Why is this ironic? Well, Norman Osborn later becomes the Director of a new Thunderbolts team after the events of Marvel's Civil War. Click HERE to see more. 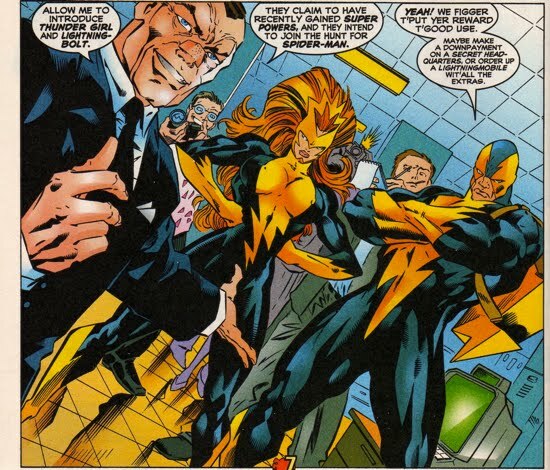 After introducing Thunder Girl and Lightning Bolt to the public, Osborn immediately double-crosses them, having realized that they are wanted fugitives Absorbing Man and Titania. Spider-Man, along with help from Daredevil, is able to defeat the duo and remain at large. There's a seemingly minor event that occurred in Peter Parker Spider-Man #87, but upon closer inspection (and hindsight!) it is actually quite significant. Since Norman’s schemes against Peter are rarely one-dimensional, he also attacked Peter’s family. Norman sent one of his thugs to kill Mary Jane, Anna Watson and Jill Stacy while Peter was distracted with (err…glued to) Paul Stacy. Luckily Jimmy-6, a Spider-Man ally and grandson of Don Fortunato, saved them from the thug’s attack. But before Jimmy could extract any information, the thug took a suicide pill and keeled over. 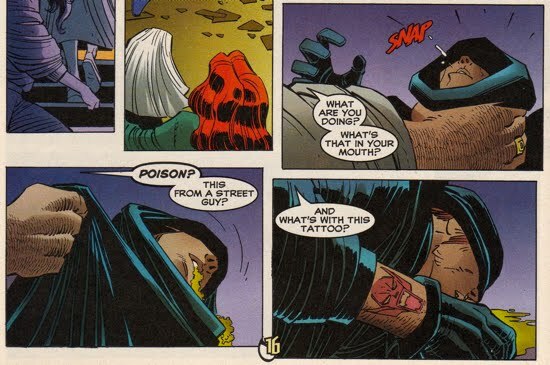 Jimmy then lifted the sleeve on the arm of the dead thug revealing a ‘laughing Goblin’ tattoo, thus confirming the Green Goblin’s involvement with the assailant. Osborn loyalists bearing Goblin tattoos…how interesting a concept! This idea is explored again here. Things go from bad to worse for Spidey in Peter Parker Spider-Man #88, when a local thug named Joey Z is found dead. The thug appears to have died from asphyxiation after having been wrapped up in what appears to be Spider-Man's webbing. 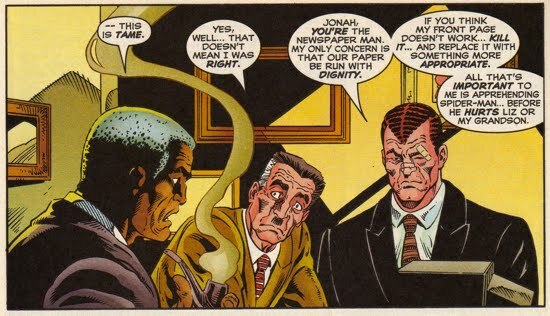 When Parker, along with Ben Urich and J. Jonah Jameson, arrives on the scene, he is confronted by Norman Osborn. After some subtle taunting from Osborn, Peter takes the photos necessary for the Bugle and heads home. On his way back, he sees (or at least is convinced he sees) the Green Goblin. He immediately changes into his Spider-Man garb, only to find that it was just an apparition. Peter then resolves to confront Norman in his offices once again, this time in his civilian identity. 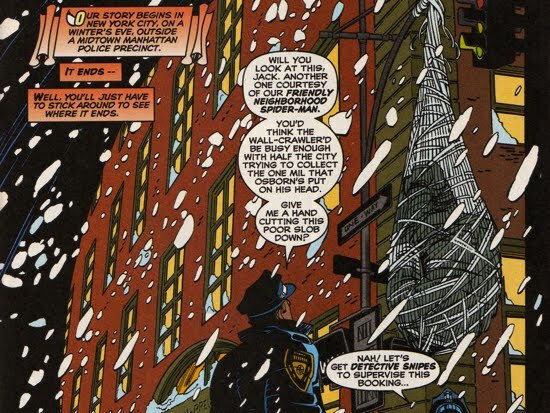 He asks Osborn, "What do you want" to which Osborn responds, "I want you ruined, I want your family ruined…" Peter leaves, and stealthily abducts Osborn as Spider-Man and brings his nemesis to the rooftop of the building, away from any cameras. After pushing Peter's buttons further, Norman jumps from the rooftop, Spidey saves him but in the process, exposes himself to the police. Spider-Man is forced to flee as Norman plays the victim once again. The Daily Bugle remains in constant flux as the editor in chief, Joe Roberston, tenders his resignation after another argument with Jameson in Spectacular Spider-Man #254. 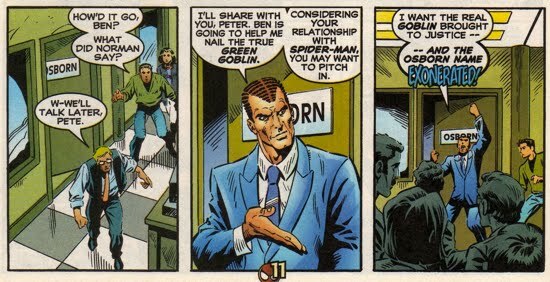 Another nefarious plot of Norman Osborn commences when Sir, Meuller's guinea pig, attacks Norman in his Daily Bugle office. Spider-Man intervenes, but it was a trap, and Sir gets the upper hand on the wall crawler. Spidey is subjected to Dr. Meuller's experiments as he induces feelings of anxiety and fear to see how much Spider-Man can handle. Clearly these are the experiments that Osborn had funded for Meuller. 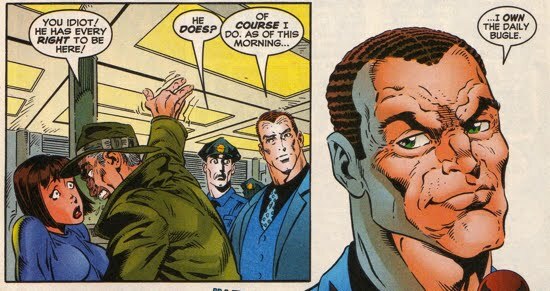 Meanwhile, Osborn enlists Ben Urich, a total surprise to the reporter who presumed Norman was going to fire him, to help him find the "true" identity of the Green Goblin. 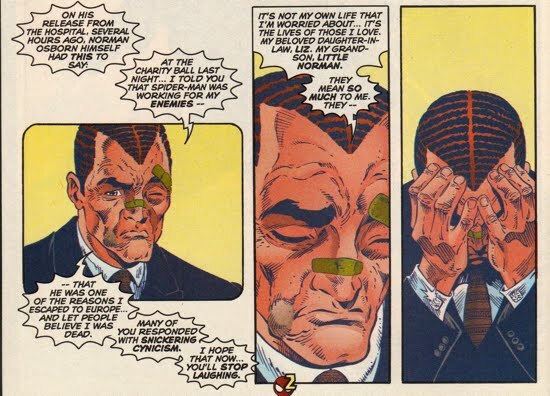 Urich obliges, although he remains wary of Osborn's real intentions. Spider-Man eventually breaks free of Meuller's restraints, inspired by images of his Aunt May and Uncle Ben. Spider-Man's will power inspires Sir, who is now awol. While slowly destroying Spider-Man's image, Norman is building up his own throughout highsociety. 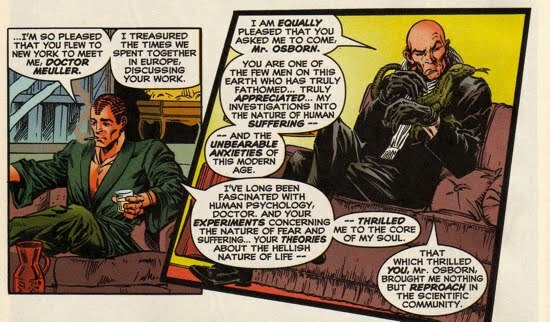 Osborn is featured in two non-Spider-Man books, both of which reflect Norman's new status and opulent lifestyle. In Iron Man V3 #1, Norman is seen given advice to Tony Stark, who had just returned to Earth after his battle with Onslaught. He informs the fellow businessman to "take back what is [his]…". 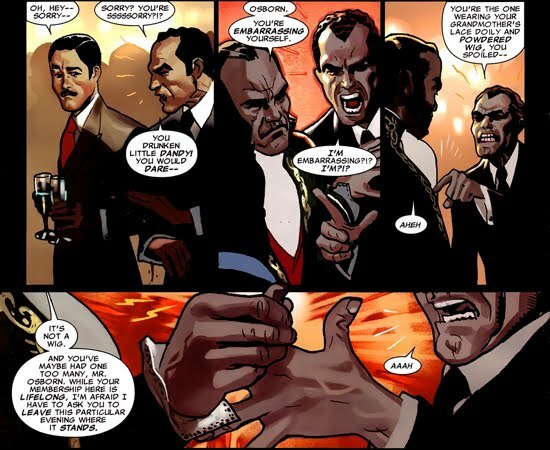 Norman is also featured briefly in X-Men #73 as a member of the Hellfire Club attending a posh gathering in Brazil. 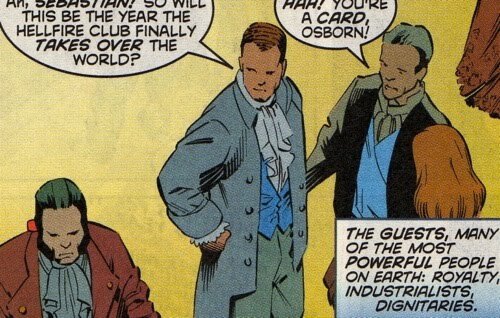 Later, in a retconned story featured in Uncanny X-Men Annual #2, Osborn is once again seen amongst the world's elite at the Hellfire Club. However, this time he was not enjoying himself. After Tony Stark, while flirting with Emma Frost, inadvertently spilled his champaign on Norman causing him to flip out on Stark. Sebastian Shaw stepped in calm Norman down and when Norman flipped out on him too, Shaw snapped his finger, breaking it. Norman was then forced to leave the party. Interestingly, Norman insulted the group for wearing their 'lace doily and powdered wigs', yet when he was seen in X-Men #73 amongst the crowd, he was wearing that posh Hellfire get-up. So he must have embraced their culture at some point. It should be noted that its difficult to place whether the events of the Uncanny X-Men Annual #2 took place before or after the events of X-Men #73, it would seem as though they took place prior. The extent and manner with which he became involved in the Hellfire Club is currently unknown. But one thing is certain, the public perception of Norman Osborn is certainly very favorable at this point in his career.